Watching the leaves turn color on the Greenlink Trail, the sunset from the top of Coxheath Mountain, or the raw power of the ocean waves from the Louisbourg Lighthouse Trail; all evoke a feeling of wonder for those who visit these and other trails throughout the CBRM. 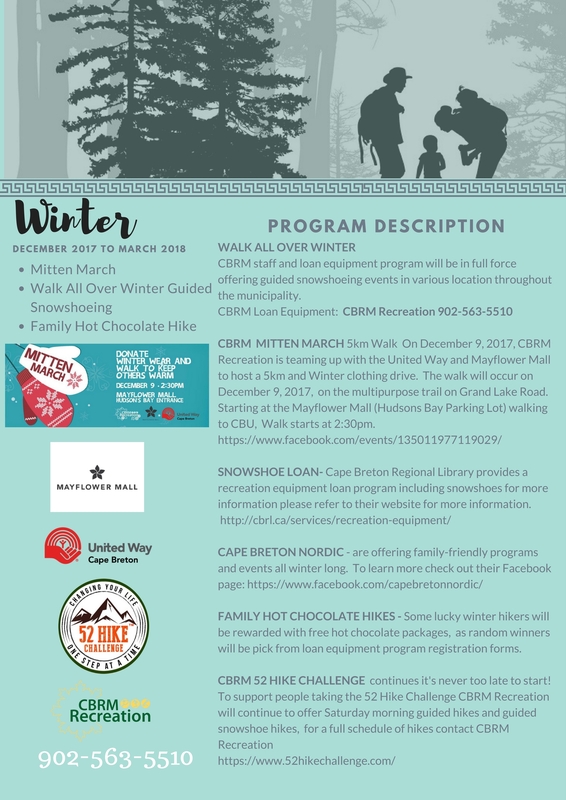 CBRM Recreation introduces the CBRM Trails Series, a program to be offered over all four seasons. Trail use provides fun recreation all year round. The series begins with an End of Summer session taking place from September 23 to 30 featuring guided lunch hour hikes, on trail activities, and many other trail focused programs. The End of Summer session will also introduce the 52 Hike Challenge, which is a global movement empowering people to take a personal journey to discover the physical, mental, and spiritual benefits gained through hiking once a week for an entire year. The second installment, the Fall session, will occur from October 21 to 28 and will include a Halloween Hike at Night event. In the Winter session, you can expect a Walk All Over Winter guided snowshoeing adventure and, finally, the Spring session will include a Multi-trail Capture the Flag challenge. More information will be released about each session as each season approaches. For guided hikes, see the below image. To register for the 52 Hike Challenge, click here.